I have maintained a long hair for years and years. I wanted the feeling of having a long and versatile hair. You can braid them, tie them up or let them flow. However, when I had a baby, just a few short weeks after I gave birth, I quickly realized that having a long hair plus living in a tropical country aren’t going to be a good combo. With a heavy heart, I cut my hair short. I horribly disliked all the photos of me with a short hair. It just wasn’t my style. But what to do? If only I could work magic and make my hair long in an instant. Apparently, there’s magic. You call them box braids. 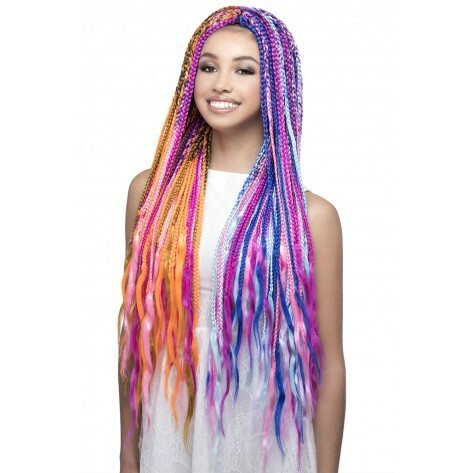 These box braids from Divatress make you shift from one look to another in minutes. You can shift from your naturally black hair to colored hair. You can shift from having long straight hair to braided hair without getting yourself sit down for hours in a braid shop. You don’t have to style yourself hours before your event. Now that’s magic, huh? One of the benefits of these box braids is that they are low maintenance. They are easy to care for. Not just that, if they are well taken cared of, these box braids can last you months. Imagine yourself, just slipping them on and creating a new hairstyle in such a short time? It must be heavenly! Tell me, do you also feel tired of styling your hair day in and day out? My hands are raised all the way through the roof. Would you like to make life easier for you and use these box braids instead? If you say yes to that, then this box braids will answer your prayers! Try them on and see how these box braids can fit your fast paced lifestyle.